The UK electoral map: which regions and counties will decide the result? I’ve spent the last few months on this blog touring the electoral map to size up the parties’ chances in every region of the UK. Now that I’ve completed my journey, it’s possible to get an overview of how each area of the country will determine the election result. Broadly speaking, much of the eastern half of England’s coastline, from Northumberland all the way down to Suffolk, borders an area that is not going to see much drama at the election. These regions contain proportionally very few marginals and a great number of safe seats. Conversely both north-west and south-west England will see much activity, with a total of 39 marginals between them. Add in Merseyside and Greater Manchester and this number rises to 53. Outside London, most of the southern half of England won’t entertain much in the way of drama. The Midlands is a different matter. If you include the West Midlands metropolitan authority with the East and West Midlands, here lie a total of 39 marginals. 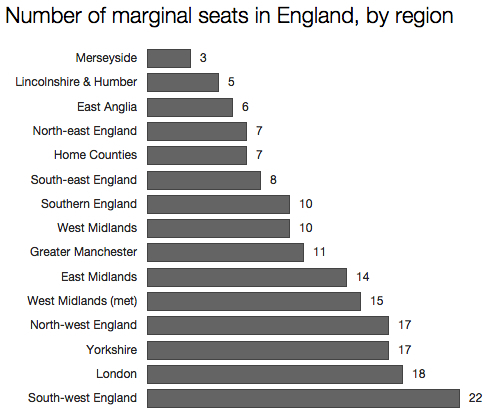 It’s perhaps not a surprise that the regions which contain the UK’s three biggest metropolitan centres are those that also contain the greatest number of marginals. 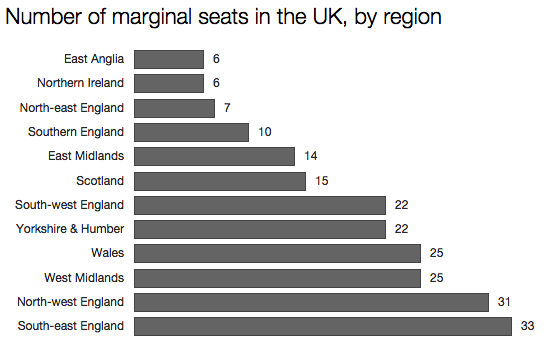 But look at Wales: 25 of its 40 seats are marginals, the majority of them currently held by Labour. These constituencies ought to be safe, but the mere fact they have such slim majorities means Labour will have to tie up resources in Wales that could be spent elsewhere in the country in target seats. Speaking of which, here is how the counties of England are likely to be prioritised by both Labour and the Tories, according to the number of target seats they offer to either party. Outside of London, Labour’s number one county is Lancashire, with potentially half a dozen seats up for grabs. Note that East Sussex, perhaps not obvious territory for Labour, could offer the party four gains. The same could be said of Norfolk, where three seats are in play. 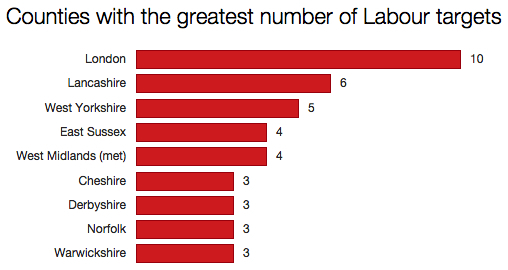 The two lists overlap in four areas: the West Midlands metropolitan area, London, West Yorkshire and Lancashire. Otherwise the two parties won’t have much cause to find themselves encroaching on each other’s turf. 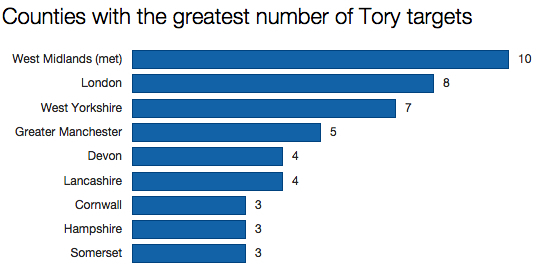 Three of the Tories’ top areas are in south-west England – Cornwall, Devon and Somerset – where Labour has barely a toehold. Here the fight will be between the Tories and the Lib Dems. In short, this election is not going to be framed by a nationwide campaign. Different battles will take place in different parts of the country, with no one party performing (or even bothering to perform) consistently coast-to-coast. And of course both Labour and the Tories have other foes to fight apart from each other: principally the SNP for Labour in Scotland and Ukip for the Tories in England. Depending on your postcode, you may be about to find yourself in a four-month whirlwind of electioneering, or a near-wilderness of activity. In both cases, I wish you good luck. I did separate blog entries for the metropolitan authorities of Merseyside, Greater Manchester and West Midlands, and for London. I also did surveys of Scotland, Wales and Northern Ireland.